Last August we took over the ownership of the sweet shop in the Market Hall, we’ve finally got round to sprinkling the Toots magic on the unit after waiting for our floor to be resurfaced. We’ve now got one of our beautiful chocolate fridges positioned in the shop and customers can now walk straight into the shop. As a few of you will know the shop units in the market all have large static counters, we’ve removed ours making the shop feel much bigger and open. The shop looks so much better now people can walk into the shop and look at the sweets properly as well as being able to have more choice. products and services available on our website as well as linking up with other shops in the market to provide some exciting services (announcements coming soon). 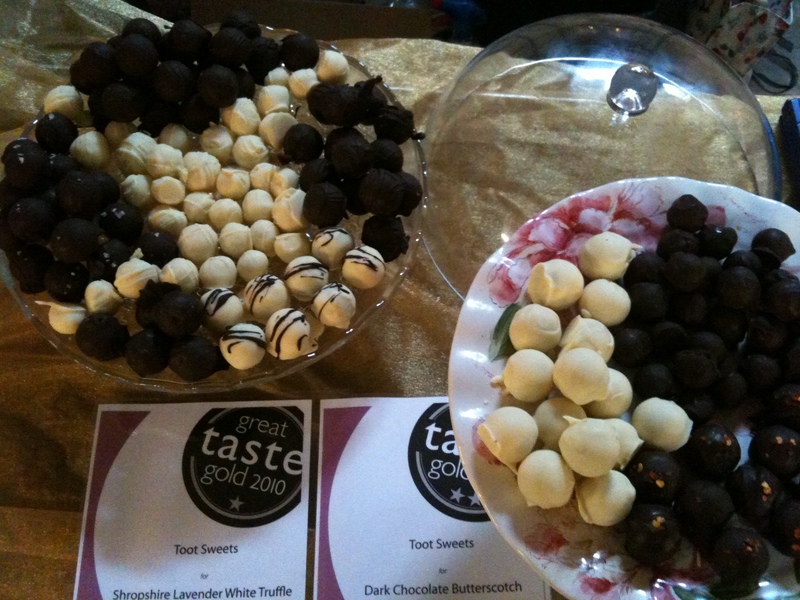 We’ll have a dedicated Wedding Favour section, our handmade chocolates, truffles, chocolate bars, and lots of well known traditional sweeties, party bags, lolly pops and lots of special at weekends. crafts and vintage delights. 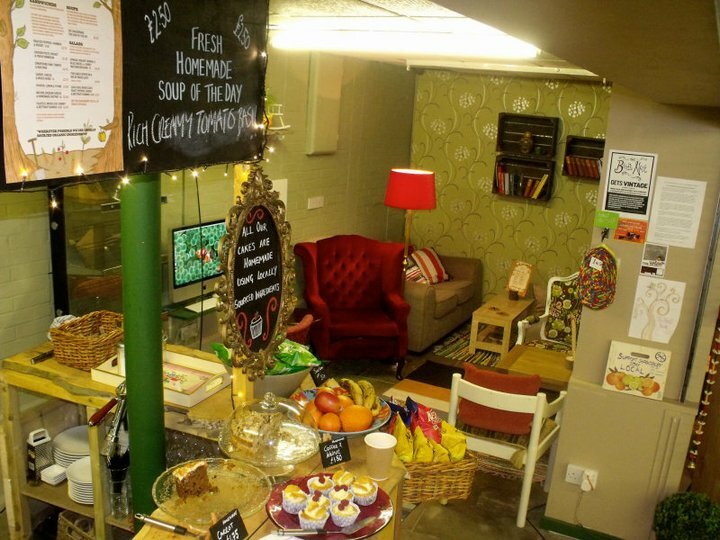 My shop is situated just on the corner of the newly revamped area next to the Birds Nest Cafe, it offers a fabulous mix of whole foods serving Fair-trade tea and coffee, homemade soup and delicious freshly made sandwiches. I sampled a Hummus and Roasted Vegetable sandwich the other day. A great combination of flavours enhanced with some pesto and fresh bread. Arran and Victor have worked hard to transform the cafe area using fairy lights and really tree branches to decorate the walls and ceiling. All the furniture is recycled vintage pieces picked up along their travels. designed and made gifts such as dresses and aprons. Jo has a huge following in Shrewsbury because of her wonderful and creative one off pieces. and a must for any student or vintage fan looking for a statement piece with character. helping to spread the arty message with classes for children. Recently she held a paint class where toddlers got the chance to paint cats and learn about how they moved; they finished the class with a story read by Susan from Pengwern books. A lovely interactive class with many more planned. foodie to visit; Mirage Mediterrean Mezze. Working within the food industry you really do get to experience lots of good and bad eateries. Mirage is one of the amazing ones; family run and bursting with so much potential. Situated at the back of the market in the opposite corner to Toot Sweets. Mirage sells a range of Mediterranean goods as well as serving freshly made food in its restaurant area, food is also available to take away. I often pop over for a wrap for my lunch; I can highly recommend the Halloumi wrap. A vibrant combination of salty warm Halloumi dressed with chunks of tomato, refreshing mint leaves and cooling cucumber; a vegetarian’s delight! With a range of mezze dishes (tapas style) you can sit down order a few dishes and while away the afternoon catching up with friends in the relaxed atmosphere. The Baklava is also exquisite; layers of puff pastry adorned with pistachio nuts and drenched in honey, baked and cut into cubes. I often find shop bought baklava is too sweet and usually baked to an inch of its life making the risk of breaking a tooth likely. Mirage’s baklava is definitely worth a try, moist, sweet and positively nutty! 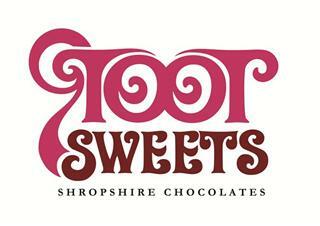 not already a member of the Toot Sweets Page please join. Great blog, Julia and love the new look of it too! I really enjoy the Market, and thanks for pointing out Mirage – I hadn’t found that yet. 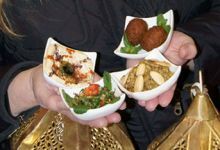 I love mezze, it sounds wonderful! Your corner of the Market is looking marvelous and a lovely place to spend a quiet half an hour in a hectic trip to town. A haven of lovely creative, special products and services. We are very lucky to have such enterprising people in Shrewsbury. I hope the public will flock to support you.